NO ONE WANTS TO BE THIS TEACHER’S PET . . .
Everyone else is talking about Eastlake High’s gorgeous new math teacher, Mr. Beck, but Kaylee Cavanaugh has bigger things on her mind. 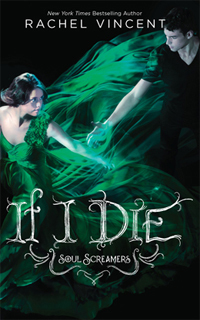 Kaylee’s a banshee—her scream is a portent of death. But the next scream might hit too close to home. Kaylee’s borrowed lifeline has almost run out. Yeah—it’s a shock to her, too. So to distract herself from her own problems, Kaylee is determined to defend her school against the latest supernatural threat. That hot new teacher is really an incubus, who feeds from the desire of unsuspecting students. The only girls immune to his lure are Kaylee and Sabine, her boyfriend’s delinquent ex-girlfriend. Now the unlikely allies have to get rid of Mr. Beck…before he discovers they aren’t quite human either. But Kaylee’s running out of time, and those who love her will do anything to save her life. Oh boy, I can't imagine how readers who read this right after it was published were feeling. They were probably freaking out. The only thing that kept me from sobbing was the fact that there's another book in this series. So we don't really lose Kaylee. Even though I had some pieces of the plot ruined (because I'm one of those people who has to read book descriptions of later books in a series before I read the one I'm on), I was still slightly melting inside while reading the ending. I couldn't handle it, but I couldn't put it down either. So the paranormal parts of this world kind of take a slight back-burner role in this book. This book is all about the characters, and where they stand with each other. Kaylee and Nash. There's a lot of hurt, betrayal, and distrust in this relationship. And as much as they try to patch things up, can they really act like everything's fine for them? And Sabine's only counting down the days until she gets Nash to herself and can be there to console him when Kaylee dies. And Tod? Well, he's Tod. Only gorgeous Tod who wants to save Kaylee just as much as the next reaper (oh wait, that made no sense). Love the series, must place hold at the library for the next one. And then I found out that the series has ended. At least I have two more books to keep me occupied, right?